Dignitaries on the terrace at the Citadel overlooking Quebec Harbour, 18 August 1943. 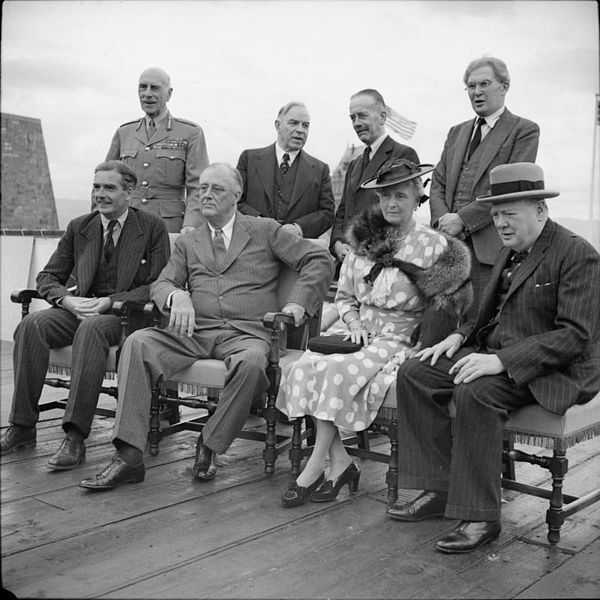 Seated are Anthony Eden (Foreign Secretary); President Roosevelt; the Countess of Athlone; Winston Churchill. Standing are the Earl of Athlone (Governor General of Canada); Mackenzie King (Prime Minister of Canada); Sir Alexander Cadogan (Permanent Under Secretary for Foreign Affairs); Brendan Bracken (Minister of Information). Photograph: H 32144 from the collections of the Imperial War Museums via Wikimedia Commons. Photograph of No. 10 taken by Leonard Bentley via Wikimedia Commons. Brendan BRACKEN, Minister for Information during World War II, Private Secretary to Winston Churchill, Privy Counciller and publisher born near Templemore Co. Tipperary 1901 lived on North Street (number required) and, for the duration of the War, at 10 Downing Street. Having led a full and prosperous life (he was a founder and Chairman of the Financial Times), he died in 1958.